Edifices of stratocones and domes are often situated eccentrically above shallow silicic magma reservoirs. Evacuation of such reservoirs forms collapse calderas commonly surrounded by remnants of one or several volcanic cones that appear variously affected and destabilized. We studied morphologies of six calderas in Kamchatka, Russia, with diameters of 4 to 12 km. Edifices affected by caldera subsidence have residual heights of 250–800 m, and typical amphitheater-like depressions opening toward the calderas. The amphitheaters closely resemble horseshoe-shaped craters formed by large-scale flank failures of volcanoes with development of debris avalanches. Where caldera boundaries intersect such cones, the caldera margins have notable outward embayments. We therefore hypothesize that in the process of caldera formation, these eccentrically situated edifices were partly displaced and destabilized, causing large-scale landslides. The landslide masses are then transformed into debris avalanches and emplaced inside the developing caldera basins. To test this hypothesis, we carried out sand-box analogue experiments, in which caldera formation (modeled by evacuation of a rubber balloon) was simulated. The deformation of volcanic cones was studied by placing sand-cones in the vicinity of the expected “caldera” rim. At the initial stage of the modeled subsidence, the propagating ring fault of the caldera bifurcates within the affected cone into two faults, the outermost of which is notably curved outward off the caldera center. The two faults dissect the cone into three parts: (1) a stable outer part, (2) a highly unstable and subsiding intracaldera part, and (3) a subsiding graben structure between parts (1) and (2). Further progression of the caldera subsidence is likely to cause failure of parts (2) and (3) with failed material sliding into the caldera basin and with formation of an amphitheater-like depression oriented toward the developing caldera. The mass of material which is liable to slide into the caldera basin, and the shape of the resulted amphitheater are a function of the relative position of the caldera ring fault and the base of the cone. A cone situated mostly outside the ring fault is affected to a minor degree by caldera subsidence and collapses with formation of a narrow amphitheater deeply incised into the cone, having a small opening angle. Accordingly, the caldera exhibits a prominent outward embayment. By contrast, collapse of a cone initially situated mostly inside the caldera results in a broad amphitheater with a large opening angle, i.e. the embayment of the caldera rim is negligible. The relationships between the relative position of an edifice above the caldera fault and the opening angle of the formed amphitheater are similar for the modeled and the natural cases of caldera/cone interactions. 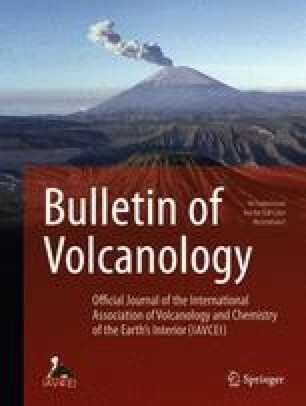 Thus, our experiments support the hypothesis that volcanic edifices affected by caldera subsidence can experience large-scale failures with formation of indicative amphitheaters oriented toward the caldera basins. More generally, the scalloped appearance of boundaries of calderas in contact with pre-caldera topographic highs can be explained by the gravitational influence of topography on the process of caldera formation. A. Belousov thanks the Russian Foundation of Basic Research, which supported this study, and funding by the Alexander von Humboldt Foundation during his stay at the Dept. of Volcanology and Petrology at GEOMAR, Germany. T.R. Walter was supported by a grant of the Deutsche Forschungsgemeinschaft (WA1642–1/2) and V.R. Troll through a travel grant by Trinity College to visit GEOMAR. Special thanks to M. Belousova for final preparation of the manuscript. Reviews by J. Stix and J. Lavallée helped to improve the manuscript.